The archdiocesan strategic plan presents two challenges for priests, deacons and parishioners, said Father Kevin Finnegan, who is already meeting those challenges as pastor of Divine Mercy in Faribault, St. Patrick in Shieldsville and St. Michael in Kenyon. Because Divine Mercy has more people and resources, it provides pre­paration for programs like first Communion and reconciliation. St. Patrick and St. Michael share their pastoral ministry and sense of community, he said. That will allow for better relationships among the people and more stability in the parishes, he said. Father Finnegan said the collaboration helps everyone learn to communicate with each other. He also sees the benefits and challenges of the proposed requirements with the new Institute for Ongoing Clergy Formation (see accompanying article), whereby all ordained clergy will be expected to have 16 hours of ongoing formation yearly. Father Finnegan recognizes the importance of staying abreast of changes in ministry, just as teachers, doctors and lawyers need to be current in their professions. But, he also is well aware of the challenges. He does look forward to participating in ongoing formation and hopes that it includes education on issues such as immigration, spirituality, theoretical views on priesthood, Catholic schools and young adult ministry. Father William Kenney, 80, said ongoing formation was expected when he was first ordained and throughout his active ministry. The former director of the archdiocesan priests’ personnel board, Father Kenney said when he was ordained, newly ordained priests and new pastors would meet with a senior pastor to help them deal with budgeting, personnel issues and other issues facing clergy. Priests were expected to attend various continuing education programs and also strongly encouraged to take a three-month sabbatical every seven years to travel, study and renew their spiritual and ministerial lives. The average priest is going to be a priest for 30 or 40 years, and many things will change drastically over those years, he said. “I think the more you can delineate what it is, the more you can spell out what you want them to do, I think, the more apt they are to do it,” he said. He said the archdiocese should pro­vide programs, whether academic or pastoral, for young clergy or make them aware of what programs are effective and available across the country. Deacon Russ Shupe, clergy placement and diaconate director, sees many advantages to having the new Center for Clergy Formation, Office of Vocations, Institute for Ongoing Clergy Formation, Institute for Dia­c­o­nal Formation and the Harry J. Flynn Institute for Catechetical Institute all housed at the St. Paul Seminary School of Divinity. “The catechetical institute will help the men to have a solid groundwork of Cath­o­lic teaching,” he said. The initiative will provide a solid education for deacons, with many of the instructors that teach the seminarians. He also sees the value of developing good relationships between the future deacons and priests, through combined class and prayer opportunities. Father Finnegan said his hope is that the plan helps people realize the archdiocese is everyone’s responsibility. The following excerpts are taken from the archdiocesan strategic plan. The Center for Clergy Formation will be housed at the St. Paul Seminary and will bring together the Office of Vocations, the Institute for Ongoing Clergy Formation, and the Institute for Diaconal Formation. • Office of Vocations — The Office of Vocations will remain unchanged. . . .
• Institute for Ongoing Clergy For­mation — A part-time director will guide the work of the Institute for Ongoing Clergy Formation. This work will involve an integrated approach to both priestly and diaconal ongoing formation. 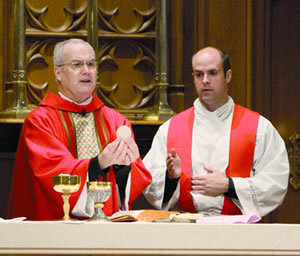 While collaboration with the Director of the Institute for Diaconal Formation will be necessary for deacons, the director will coordinate ongoing formation opportunities for the three unique groups within the presbyterate: newly ordained (ordained one to four years), new pastors (ordained five to seven years), and experienced priests. • Institute for Diaconal For­ma­tion — A full-time director will guide the work of the recently revised diaconal formation program. In collaboration with the St. Paul Seminary and under the direction of its Rector, the director will be responsible for the integration of the revised diaconal program. . . .